Summary: The Archie Carr National Wildlife Refuge (Refuge) along Florida's East Coast is the most important nesting site for threatened and endangered sea turtles in the United States. Recently, both green turtle and leatherback turtle nesting in the refuge has been increasing. The Barrier Island Sanctuary Management & Education Center (BIC), jointly operated by STC and the Brevard County Environmentally Endangered Lands Program, serves as a welcome center for the Refuge. BIC programs are generating community awareness about the importance of biological diversity, conservation of sea turtle nesting habitats, the ecology of sea turtles, and the overall health of the region's coastal resources. By building awareness about sea turtles, STC and the BIC are cultivating stewardship of these animals and instilling a strong sense of personal responsibility and stewardship for all coastal resources. STC will conduct the Building Sea Turtle and Coastal Stewardship at the Barrier Island Sanctuary Management & Education Center project. The project will include a summer Eco-Camp for kids, "Sea Turtle Stewardship Kits" that will be provided to schools and institutions, Community Coastal Stewardship Workshops, and a Lighting Toolkit for promoting sea turtle friendly lighting. Results: Eco-Explorers "Ocean Motion & Much More!" Summer Camps 2011 were filled with local and visiting children who shared unique field experiences to discover and make special connections with lagoon to ocean habitats and wildlife of the barrier island and coastal waters. Camper adventures began with seine and plankton netting and snorkeling to discover and identify life below the sea's surface. Then they were on to kayaking and benthic ecology to examine the diversity of the Indian River Lagoon (IRL) estuary and its islands. Campers participated in a Florida Department of Environmental Protection (DEP) IRL Aquatic Preserve spoil island clean-up. Next they made observations in the nearshore and dune habitats of the Archie Carr National Wildlife Refuge (ACNWR) to learn basic sea turtle research techniques and nesting behaviors with University of Central Florida (UCF) Marine Turtle Research graduate students. The newly introduced, passive aquatic sport of stand-up paddle boarding offered them a different perspective of the offshore habitat. The grand finale was observing a sea turtle nesting onshore. 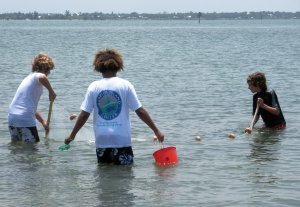 The overall results of the camper pre/post surveys indicated an average of 27% increase in knowledge of our fragile barrier island and surrounding aquatic habitats, the areas global importance to sea turtles, and how they can help protect these ecosystems as young stewards of coastal conservation. Community stewardship workshops continue to be conducted with great success. Families planted native trees in EEL's Maritime Hammock Sanctuary to celebrate Arbor Day; Women participated in a surf fishing workshop with an emphasis on sustainable fishing to preserve fisheries and our oceans; National Marine Fisheries Service invited BIC and Sea Turtle Preservation Society volunteers to participate in their annual TED Turtle Release at South Bay in the IRL; BIC volunteers attended a special ACNWR Beach Walk conducted with USFWS to learn the importance of onshore and dune habitats in relation to nesting sea turtles. Volunteers were engaged in a release of predated hatchlings and a nest excavation survey. The overall results of the their pre/post surveys indicated an average of 22% increase in knowledge of our fragile coastal ecosystems that are considered the most active sea turtle nesting habitat in the U.S. and how they can help protect them through conservation stewardship in the Refuge; and a young stewards workshop for at-risk high school students, "Secrets of the Lagoon", has been arranged with experts from UCF Marine Turtle Research to offer a presentation on the sea turtle populations and other aquatic life of the IRL followed by a field excursion to observe their sea turtle netting research. Student knowledge on the sea turtles of the IRL and how they can help protect these threatened and endangered species will be measured before and after the workshop.